Friend and fellow podcaster Karlene Pettit recently blogged on managing the A330 speed/configuration during approach. 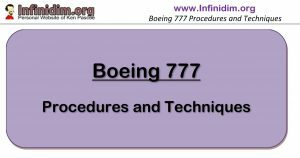 I thought it might be interesting to explore the topic on the 777. The point of Karlene’s article is that often the manfacturer’s profile doesn’t comply with the ATC environment we find ourselves in, and the performance characteristics of the aircraft we fly are such that conforming to ATC speeds on approach can lead to a requirement for exploring the flight envelope a little in terms of configuration and speed down final approach. Any discussion about speed and configuration on final – especially when diverging from the manufacturer’s documented profiles – needs to commence with a review of the Stabilised Approach concept. Behind any discussion of speed and configuration on approach is the Stabilised Approach criteria. The specifics vary from airline to aircraft type, but the essential concept is the same. The stabilised approach concept has distant origins but was developed and promulgated by Flight Safety’s Approach and Landing Accident Reduction program. A clear decision point on the approach – typically a height above the runway – by which the aircraft must meet the stabilisation criteria documented by the airline. 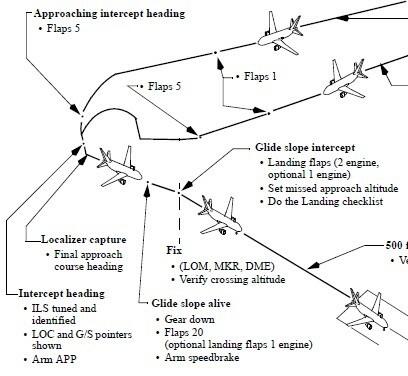 The criteria typically requires landing configuration, final approach speed, minimal required lateral and vertical divergence from the published approach path – essentially in position to land. It may even require the completion of the Landing Checklist. Know your company stabilisation criteria and remember that not only must you meet the requirement by the decision point or go around – if at any point during the approach you realise you won’t be able to meet the requirement – you should go round then and not wait until the stabilisation point. My airlines’s requirements are pretty standard and the stabilisation altitude is 1000 ft.
Having established in our mind the stablised approach concept, optimising the approach prior to that point requires a clear understanding of how the Boeing FCTM promulgates the instrument approach. The Boeing FCTM covers the 777-200/ER/LR/LRF/300 and 300ER, which means a variety of approach speeds. Apart from the documented aircraft variations, the FCTM is also aimed at a wide range of pilot skills and backgrounds, providing a clear, conservative baseline of operations which professional aviators must use as a basis from which to expand and extend to suit the operational environment. A quick glance at the pictured profile shows quite a reasonable profile for an aircraft vectored in for a 2000 ft ILS with minimum run in to the FAF – but this is patently unsuitable for operations into many capital city airports – such as Los Angeles KLAX, or Melbourne YMML – where glideslope intercepts well above 3000 ft AAL are common. Flying that approach with gear down, flap 20 at glideslope alive and landing configuration at glideslope intercept won’t endear you to the approach controller. You’ll also chew through a several hundred kilos of your reserve fuel that might come in handy should you need to head for your alternate. The FCTM documents a delayed flap concept for Noise Abatement or under “adverse conditions” (surely that describes ATC at KLAX?) which essentially flies you down the ILS with Gear Down, Flap 20, delaying landing flap selection until approaching 1000 ft AAL. At reasonable weights the 777-300ER Flap 20 speed is around 160 knots, which is still a little slow for final approach sequencing, and once again you’re basically dragging the aircraft in with lots of gear and flap. Assuming for a moment glideslope intercept at altitudes AAL of 2500 upwards, experience has shown us that the 777’s (all of them) can be flown into a 3 degree slope with Flap 5, Flap 5 speed. Note you need both of these – if you call for Flap 5 as you capture the slope, the aircraft will usually refuse to slow to Flap 5 speed – indeed at idle thrust it will often accelerate. If you like living on the edge you can fly clean, level, at Up speed as the glideslope comes alive, calling for Flap 1 and 5 in turn, reducing speed and you’ll typically be at Flap 5/Speed as the glide slope captures – as long as you aren’t distracted by a radio call or the deceleration isn’t degraded by turbulence. From that point what happens next depends on a range of factors including the specific aircraft type, the landing weight and therefore approach speed, ambient conditions, glideslope angle, etc. But in essence you’ll get one of three results. The aircraft will maintain Flap 5 speed, with minor use of thrust on the way down (light aircraft, smooth air). The aircraft will keep Flap 5 speed, but the thrust remains at idle and you might well get some creeping increase in the speed. The aircraft will begin a slow acceleration down the slope, with the engines at idle thrust. The first two are acceptable, the second requiring monitoring. The third possibility is typical in the heavy 777-300ER or even lighter aircraft when ambient temperature is high and thermal activity tends to de-stabilise your approach speed. At this point – this is where Flap 15 comes in. The Flap 5/15 ILS continues to a point at which the end of … Gear Down (Speed Brake Armed) -> Flap 20 (Checklist Up) -> Speed Reduction -> Flap 30 -> Landing Checklist Complete … meets the stabilisation point of typically 1000 ft AAL. This sequence typically takes about 800 ft if done without interruption – a more conservative value of 1000 ft covers range of operating environments. So as you approach 2000 ft AAL, you should be thinking of establishing the landing configuration having optimised your approach to this point quite well indeed.